Not all riders are experienced, in fact this is an activity many people will choose when on vacation who have never ridden a horse before. Others ride once a year, or on a few occasions in a year and then there are the regular riders who ride at their local riding schools every week. Experienced riders and Pony Club members are well aware of what to look for when choosing where to ride and checking that the equipment and horse tack is safe. If you are planning to ride a horse, you should first check that your insurance policy will cover you should you have an accident - just the same as if you are participating in any active sports. Horse riding establishments in some countries will not always have the same stringent safety rules imposed on them as they do in North America, Australia and Europe, and will rarely provide you with a riding safety hat. If you have your own, you will find it is easy to pack in your suitcase among your clothes. Equally essential to the hat, is footwear that is safe to ride in. You need a pair of boots or shoes, not with laces as the tongue of shoes with laces gets caught in the top of the stirrup meaning that if you fall from the horse, your foot will get caught in the stirrup. Safe footwear should have a sole that is non-slip with a half - inch heel. Some establishments provide leg chaps, a wrap that will cover your lower leg snugly, and partially the top of your foot. These are excellent, as they give you more "leg" when riding, and protect the top of your foot from bruising if you are not wearing boots. Choosing where to ride can be tricky. In the UK for example, you just have to look for the BHS sign, but in most vacation resorts you will rarely see this. Look around first, and ask yourself is the yard tidy, are the stables clean. Look at the horses in their stables, are they calm and sedate, or do they jump to the back of their stable when you approach. A well cared for horse will be a horse who will listen to your instructions as you ride, whereas a horse living in chaos and an irregular routine will be excitable and will not pay attention to you. You must be absolutely honest about your riding ability. 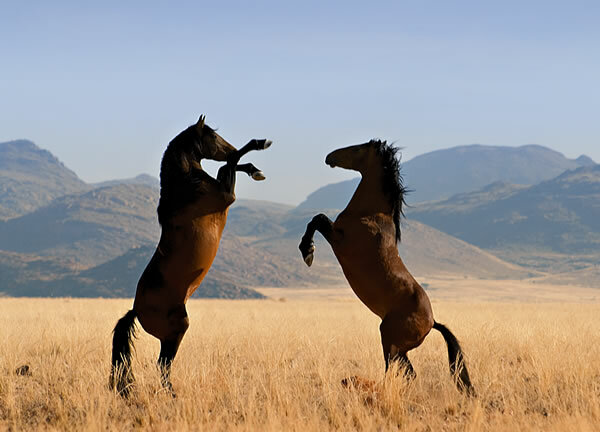 These horses normally fall into two categories, and most will have a "hard mouth". This means that they have had the bit pulled this way and that for a long time by novice riders and they have become insensitive to it. If you ride a frisky horse without any brakes as a non rider, you will be in trouble. An experienced rider can stop the horse using other skills if necessary and neither will they panic and scream if the horse decides to run. You need a suitable quiet horse to enjoy your experience, and your guide or instructor can quicken your horse for you if YOU decide you want to speed up. Your horse should be wearing a running martingale, which includes a neck strap, especially if a child is riding. This discourages the horse from throwing his head up and down - and also gives you something to grab if you feel insecure. In Middle Eastern countries, they normally use a standing martingale like the ones you see on polo ponies, as the horses are usually Arabs and can be sprightly. The reins should not be bits of rope, or tied in knots. Now for the most important part - the girth and girth strap. If you lift up the side flap of your saddle, you will see where the girth strap is buckled to hold the saddle on the horse. On the saddle itself, you should see two separate pieces of strong webbing. One piece will have one buckle, and the second piece will have two buckles. On the girth strap which goes around the belly of the horse, there will be two or sometimes three buckles. It is the most important thing you do to check that one buckle goes on each separate piece of webbing. This is so that if one girth breaks, the other piece will still hold on the saddle - and you. Check both sides. Check your stirrup leathers are in good shape, they should not have knots and splits in them.